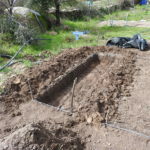 As opposed to building soil above ground with a raised bed, a sunken is bed below ground where it is cooler and wetter. 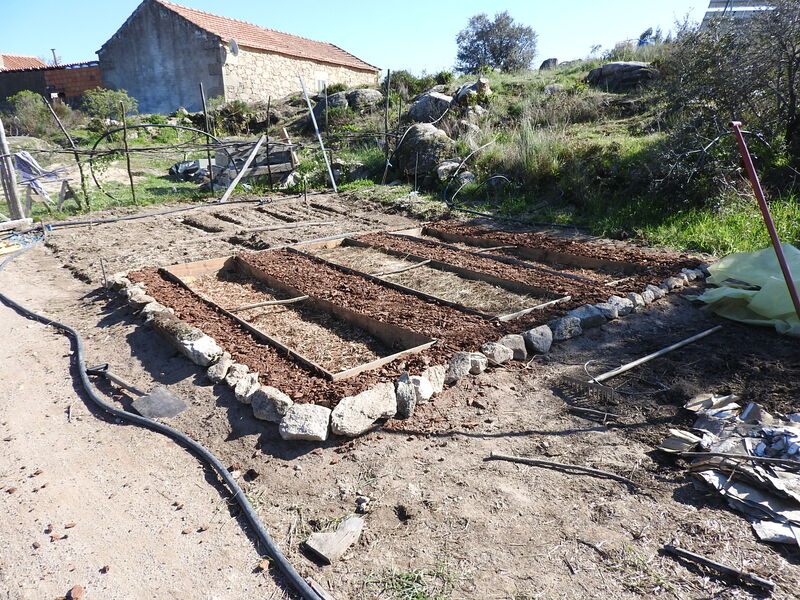 This type of bed appears to work better than a raised bed in Portugal’s hot and dry summers. 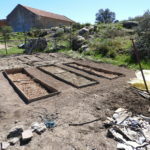 I first heard of these types of beds at a Food Forest course with Doug Crouch at Terra Alta in Portugal and later found out that these types of beds were also used by the Moors. Probably meaning that sunken beds existed on our land as it was most likely cultivated by the Moors. 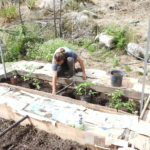 Preparing a sunken bed is a lot of work upfront but the rewards can be enjoyed for many years to come. 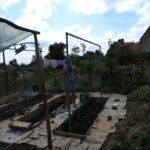 On our latest sunken bed we also built a variety of trellises to help annual plants such as tomatoes, bean and cumbers to climb up. Many volunteers and I built this over 4 months during winter and spring to prepare for 2018’s summer planting. Our first attempt at a sunken bed was dug in Autumn 2017, it was 5 beds linked together with keyhole paths to increases the bed sizes. 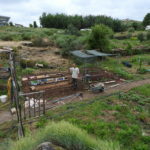 What we learnt from this is that the paths wanted to collapse in and so with our newer sunken beds that we are showing you here we did not include keyhole paths and propped up the paths with wooden forms. 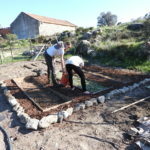 At Keela yoga farm Laurence usually comes up with the designs and then empowers different volunteers or course participants to implement them and provides support where needed. 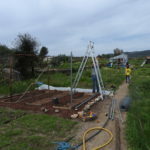 With bigger projects like these many people over months put a lot of hours into one project, for example volunteer Mira spent a month working on the first three beds with help from other volunteers, then Johannes built the first trellises. 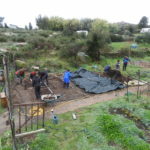 joao then spent another month building the next three beds and trellises and many people helped build the compost and bring in wood chips, weeding and planting. So a big thank you to all the volunteers and friends that helped with this project that will be here for years to come. 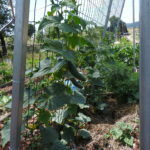 Photo gallery of our trellised sunken beds being built and with plants growing up them. 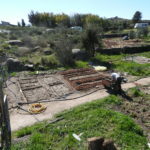 Beds were marked out, dug and top soil saved. 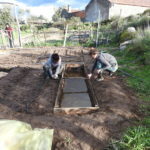 How we made the sunken bed. Preparing compost. 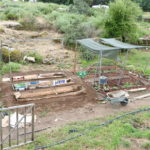 We started with hot compost piles so it is ready for when the beds are dug. Prepare wooden forms to fit the bed. Mark out the ground with string. 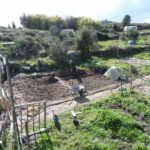 We made the beds three meters long and 75cm wide for easy access for weeding and as this is what the space allowed. I would of preferred 1 meter wide beds so that we could of fit two rows of some of the vegetables instead of one. Dig out the top soil and save this to one side. 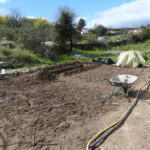 At this point I should of prepared drip irrigation pipes so that they go under the paths and into each bed. We then amended the sub soil below by digging it over with some compost and lime as the soil is acidic and ow in calcium. 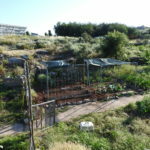 this was a one time affair as after this it will be no dig and will only be amended with compost. Place the wooden forms in place and secure by screwing them into a wooden stake in each corner and middle of the bed. We made sure that the top of the form was level and goes 5cm above the level of the paths to allow for mulch in the paths. If the planks were too thin they did not function too well as the path fell into the bed under the planks. We dont have any slugs or snails here but these wooden forms may attract them if you do. 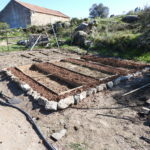 Also we learnt from the first beds that placing cardboard along the sides of the beds and folding them into the paths saves on weeding, so we did this for the last three beds. We then levelled out the paths against the for. 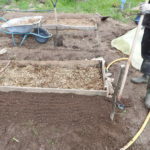 We then put the top soil back into the bottom of the beds and filled with ready compost from the hot compost pile, compost from our chicken compost system, worm castings and composting worms. If i did this again i would layer the top soil in or mix it into the compost. We then covered the compost with a think green woodchip mulch from mimosa (acacia) tree branches. We put down cardboard in the paths with a thick layer of pine bark for mulch. This is to keep weeds of the path, make it clear where to stand and make it look nice. 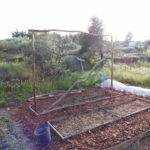 We then built a variety of trellises with metal or wood and staked the posts 1 meter into the ground with the hope that they will be permanent. 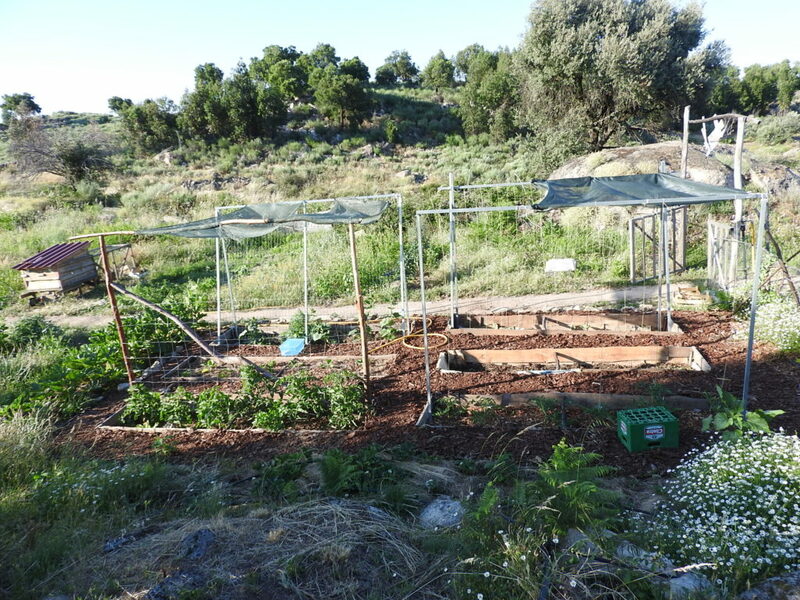 We built them all differently so we could experiment growing different vegetables up them so we know what type of trellises to build in the future when we grow these vegetables more large scale in our lower terraces where it is naturally cooler and wetter and idea for summer plantings. 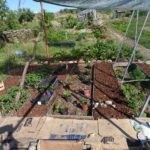 In the six sunken bed we planted two beds of tomatoes, 1 bed of cucumbers, 1 bed of pepers and eggplants and one bed of beans. 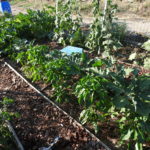 In each bed we planted a variety of companion plants. 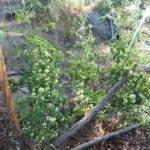 It is now later summer and we found that the plants could take up more water with much less irrigation. At the beginning it didn’t even need any water as the roots were deep enough to get water from the water help in the deeper soils. We only needed to water once per week at the hottest times. However some of the compost at the surface went very hard as it dried so it would of been better to continue to just splash water daily to keep all the compost softer and more alive. 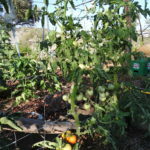 For the tomato trellises i found the wire fence to be stronger that the string but the wire cause some bruising to the tomatoes. The string broke a few times so next year i will try with stronger string. So far the only issue i have had with the crops have been spider mites, next year when i spray down the compost i will also spray the plants to trey and keep them down.